Perhaps the most talented voice actor of the twentieth century, Mel Blanc, nicknamed "Man of 1000 Voices," was born 100 years ago today. Blanc died in 1989, but his memorable vocal creations live on in Warner Brothers cartoons and elsewhere. We all instantly recognize the images of Bugs Bunny, Daffy Duck, Sylvester Pussycat, Porky Pig, and Elmer Fudd--but rarely do we conceive of them separately from their distinctive voices. Indeed, these 'toon characters' bodily movements seem irrevocably sutured to their voice: if they couldn't move, they couldn't speak, and vice versa. In a sense, their voices animate them. Among his other vocal characterizations were Pepe le Pew, Foghorn Leghorn, Wile E. Coyote (when he spoke--rarely), Marvin the Martian, Barney Rubble, Woody Woodpecker (initially), the Tasmanian Devil, Speedy Gonzalez, and Yosemite Sam, the diminutive but feisty cowboy who was "the blood-thirstiest, shoot-'em firstiest, goshdarn worstiest bandit North, South, East and West of the Pecos!" 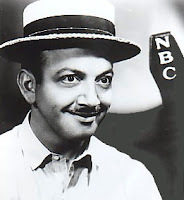 Because Mel Blanc is so strongly associated with his vocal characterizations, one doesn't immediately think of the few feature motion pictures in which he had supporting roles--Neptune's Daughter (1949) and Kiss Me Stupid (1964)--for instance; if not classics, they are still well worth seeking out simply to see the man as an actor. Although there are many websites devoted to Mel Blanc, a good overview of the "Man of 1000 Voices," by Kim Newman (find his link to the right), is available here.